As the general election begins, it’s apparent that a wide gap in confidence has opened up between the two campaigns. The Obama campaign is bordering on cocky, utterly dismissive of Mitt Romney and warning against overconfidence. Obviously, campaigns always strive to convey confidence, with even the slightest hints of pessimism seen as potentially unleashing a self-defeating cycle of doom. Mr. Law said, Crossroads research suggests that Mr. Obama’s campaign has started to gain traction among critical swing voters by arguing that Republicans, including Mr. Romney, favor an “economic plutocracy” in which middle-class voters can no longer count on financial security, even though they work hard and play by the rules. In other words, their research shows that Obama’s campaign to frame the economic debate is working. It’s genuinely quite rare for campaigns (or, in this case, quasi-campaigns) to make that sort of confession. It’s also an interesting concession for what it tells us about the debate within the Democratic Party. The centrist, pro-business wing is always warning Democrats away from any hint of economic populism. “Third Way” is the current representation of this view, and has spent months cheerfully ignoring the fact that Obama’s approval ratings hit their bottom when he was desperately pursuing Third Way’s recommended strategy of pleading for a deficit deal with Republicans, and has recovered since he abandoned that and started framing the choice in populist terms. Third Way’s poll today, as usual, constructs survey questions designed to prove that Obama is running dire risks of alienating the center with his populist language, downplaying the fact that its own poll shows Obama winning among swing voters. It’s likewise inconvenient for Third Way that its poll drops the same day that Karl Rove’s group concedes that the populist element of Obama’s economic message is currently winning. It’s never a good sign when a campaign is blaming the voters for making “excuses” for the opposing candidate. This is a key question in the election. Republicans want voters to hold Obama responsible for the widespread pain created by the global economic crisis, and Obama wants them to compare his policies against a Republican alternative. Both sides seem to agree that, at the moment, Obama is winning. Now, that is not the only factor at work in the election, and others bode much better for Romney. The March jobs report was weak, which is possibly a statistical blip or possibly a sign of a stalling recovery. And Romney right now seems likely to enjoy a significant edge in outside advertising, with his Super-PACs rolling in cash while Obama’s struggles. But Democrats discovered to their frustration in 2004 that opinion about the incumbent is hard to budge, and found that the election debate hinged more on the acceptability of the challenger. 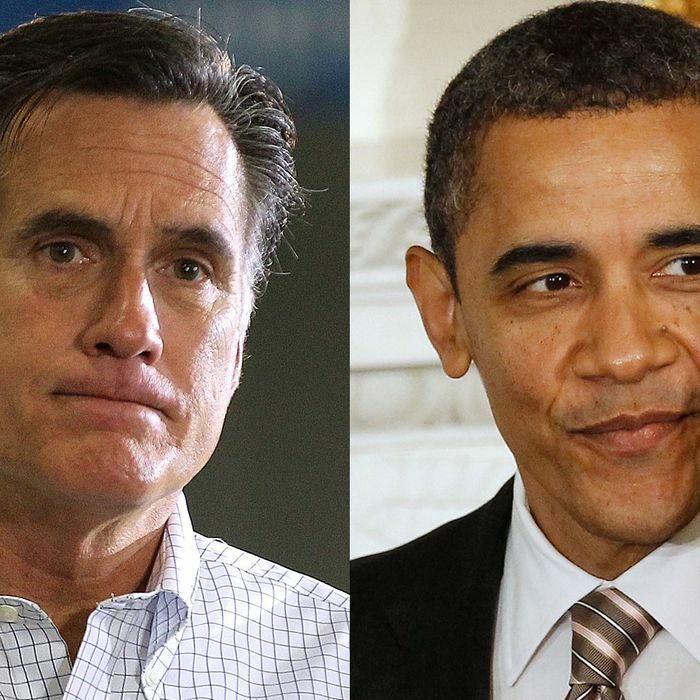 The current confidence gap is a sign that the last few months have gone as well as possible for Obama, and Romney begins the race in a hole.